The ritual of fasting on certain days or for extended periods of time has existed in many parts of the world since ancient times. The motives for fasting differ from society to society and include cleansing of the body, restoration of energy, penitence and spiritual purification. Ancient Egyptians, for example, believed that fasting for three days in a month would ensure good health and youthfulness. The ancient Greeks fasted on certain days in order to purify their bodies and to sharpen their mental faculties. The Greek physician Hippocrates, who lived in the 5th century BC and who is generally regarded as the father of medicine, prescribed fasting as a means of combating illness. Fasting has an important place in Jewish tradition and has been associated with penitence and spiritual purification. Jews observe a fast on the Day of Atonement (Yom Kippur). Fasting plays an important role in Hindu beliefs and rituals. India's Jain community has a tradition of rigorous fasting. Some Jain monks fast for months at a time, surviving only on warm water. In earlier times, devout Christians fasted for 40 days during Lent in memory of Jesus Christ's 40-day fast in the wilderness. The custom of fasting also exists among several tribal communities in south and central America, Africa and Australia. Fasting is among the five fundamental tenets-the Five Pillars-of the Islamic faith. Fasting during the month of Ramadan is obligatory on every adult Muslim male and female of sound mind. 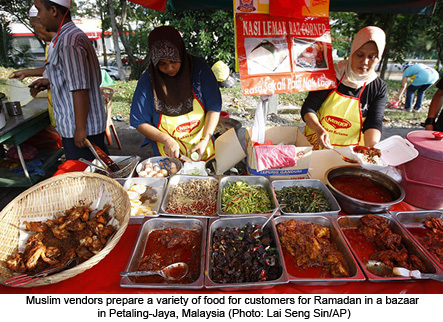 However, certain categories of persons are granted exemption from fasting. These include very old and frail persons who are unable to bear the strain of fasting or are likely to fall ill if they fast, a gravely ill person and long-distance travellers. A distinctive feature of the Islamic faith is its emphasis on moderation and the pursuit of the middle path in every walk of life as well as in worship and prayer. This principle is also reflected in fasting. A Muslim is forbidden to fast for days together without eating. One is required to eat a meal (suhur) before dawn, so that the body gets sufficient nourishment for the day, and to break the fast after sunset. Fasting has multiple -- including physical, moral, social and spiritual -- benefits. The Prophet (saaw) is reported to have said: "Fasting is (like) the body's tax". Just as paying the obligatory tax (zakat) on wealth and other material assets has a cleansing effect, fasting results in the cleansing and purification of the body. In the Islamic tradition, one of the important objectives of fasting is moral and spiritual purification (Quran 2:183). Fasting entails not only abstaining from food and drink but also keeping away from evil thoughts and deeds. The Prophet said: "One who does not give up (the habit of) telling lies and (other) evil habits even while fasting, God has no need for him to keep hungry". Therefore, fasting should be accompanied by the cultivation of virtuous and noble qualities. The Prophet described the month of Ramadan as a month of sharing, sympathy and fellow-feeling and urged his followers to offer food to poor Muslims to break their fast. 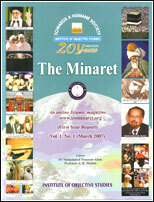 He also emphasized that good deeds and charity would be rewarded manifold during the holy month. 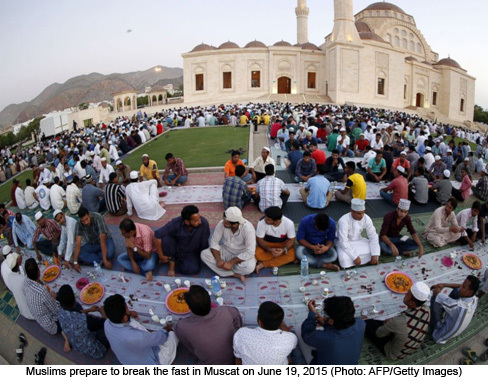 Fasting during the month of Ramadan is observed according to the lunar calendar. This is not just a remnant of an ancient calendrical system but is imbued with universal significance as well as compassion for the Muslim ummah. The change of seasons is a universal phenomenon. Weather conditions during some months of the year are pleasant or at least bearable while those in other months are harsh. Similarly, some regions have hospitable or bearable weather conditions during the large part of the year while other regions have harsh weather conditions through much of the year. If the month of Ramadan were to be reckoned according to the solar calendar, it would fall during a fixed month of the year. And if Ramadan always coincided with inhospitable weather conditions in a given region, it would put the local Muslim community under considerable hardships. The Quran says, "Allah intends every facility and convenience for you; He does not wish to put you to difficulties" (2:185). The great benefit of the lunar calendar is that, since it is shorter than the solar calendar by 11 days, the month of fasting keeps rotating through different seasons, providing relief for some period from oppressive weather conditions. Muslims societies around the world are characterised by a great deal of diversity in respect of physical features, ethnicity, language and cultural patterns. However, certain unifying threads bind all Muslim communities together regardless of external differences. These unifying threads include the core Islamic beliefs and doctrines, the centrality of the Quran, the Five Pillars, the use of Arabic as a universal liturgical language, and the institutional structure, especially the mosque. These universal features reinforce the unity and solidarity of the Muslim ummah. Fasting is one of the core elements of Islamic universalism and as such greatly contributes to the cohesiveness of the community. Unfortunately, most people, including Muslims, do not follow a healthy lifestyle and balanced dietary habits. This is particularly true of the well-to-do sections of society. Most people are in the habit of consuming unhealthy, high-fat diet, including processed and junk foods. Unhealthy eating habits and over-indulgence, coupled with a sedentary lifestyle, result in obesity and an increase in free radicals in the body. Studies show that obesity rates have increased around the world. Dietary abuse and overeating are responsible for a number of degenerative diseases, including atherosclerosis, hypertension and heart disease, allergies, diabetes and certain types of cancer. Obesity has major adverse effects on health. Morbidly obese persons have as much as a two-fold increase in mortality. In the US, an estimated 65 million adults are overweight or obese, leading to 300,000 deaths annually and more than $100 million in annual health costs. Obesity has a positive bearing on reproductive disorders, pulmonary disease, joint and connectivity tissue disorders, osteoarthritis, and menstrual abnormalities. It is an independent risk factor for cardiovascular disease in men and women, including coronary heart disease, high blood pressure, high blood cholesterol, stroke and congestive heart failure. The World Cancer Research Fund warns that being obese or overweight increases the risk of cancer. Obesity also leads to a reduction in life span. Obesity is a major risk factor for diabetes and nearly 80 per cent of patients with Type-2 diabetes are obese. A Harvard study suggests that a diet rich in red meat, high-fat dairy products and baked goods made from refined flour is 60 percent more likely to result in diabetes after the age of 40. According to the World Health Organisation, over 370 million people worldwide are affected by diabetes and the number is expected to touch 552 million by 2030. Diabetes is a chronic, debilitating and costly disease. It is responsible for close to 4 million deaths worldwide each year. It is a leading cause of heart attack, stroke, kidney failure, amputation and blindness. When diabetes exists with high blood pressure, obesity, high cholesterol levels and smoking, the risk of heart attack increases several times. Free radicals are atoms or groups of atoms with an unstable, unpaired number of electrons. They originate in the body cells in various ways, including the consumption of junk food such as burgers, colas and processed foods, consumption of fruits and vegetables that contain chemical residues, toxic drugs, and ultraviolet light. When free radicals react with oxygen in the body they cause oxidation, which can be compared with the rusting of metal. Oxidation causes cell and tissue damage. The consumption of junk food reduces the bone mass, putting people, especially children and adolescents, at greater risk of osteoarthritis in old age. Medical research in several countries has highlighted that fasting has preventive as well as therapeutic benefits and that it plays a positive role in weight reduction, in flushing out free radicals and other toxins, in digestion and in slowing the ageing process. In his classic study Man, the Unknown (1935), the renowned French geneticist and Nobel Laureate, Alexis Carrel, emphasized the healing benefits of fasting in the following words. Privation of food at first brings a sensation of hunger..... but it also determines certain hidden phenomena which are more important. The sugar of the liver and the fat of the subcutaneous deposits are mobilized, and also the proteins of the muscles and the glands. All the organs sacrifice their own substances in order to maintain blood, heart and brain in a normal condition. Fasting purifies and profoundly modifies our tissues. Recent researches have brought out the multiple benefits of fasting for physical and mental health and for longevity. We generally tend to overstrain our digestive system. Fasting provides a much-needed and welcome physiological rest for the digestive tract and for the central nervous system. Normally, the body is constantly at work to digest foods, eliminate wastes, fight diseases, replenish worn-out cells and nourish the blood. When it is relieved of the function of digestion for some length of time, it requires only a minimum of energy to carry out the other functions. Fasting facilitates the body to carry out certain functions which are crucial for its metabolism and well-being. A major health benefit of fasting is detoxification, which involves the elimination of toxins through the colon, kidneys, liver, lungs and lymph glands. Unhealthy dietary habits and lifestyle lead to the accumulation of excess glucose and carbohydrates in the body. When excess glucose and carbohydrates are not used for energy or growth or are not excreted, they get transformed into fat reserves, which results in obesity. While fasting, the body turns to fat reserves for energy. In this process, chemicals from the fatty acids are released into the system, which are then eliminated through the colon, liver, kidneys and lungs. Chemicals which are not found in food but are absorbed from the environment, such as chemical residues in fruits and vegetables or DDT, are also stored in the body's fat reserves. Such chemicals are also released and flushed out during fasting. Fasting is a safe, relatively easy and effective means of harnessing the body's self-healing properties. Fasting leads to the diversion of energy from the digestive system and towards the metabolism and immune system. A higher efficiency in protein synthesis results in healthier cells, tissues and organs. The greater efficiency in hormone production during fasting results in the release of growth hormones. Fasting brings about a slower metabolic rate, more efficient protein production, and an improved immune system. In fasting an anti-ageing hormone is produced more efficiently. All this contributes to a renewed sense of well-being and rejuvenation. Fasting provides an effective means of calorie reduction. It releases pino-lenic acid, which contributes to a successful calorie-restriction regimen. Scientific studies confirm the positive effects of calorie reduction on the prevention of several diseases and on the extension of lifespan. According to research conducted at the Pennington Biomedical Research Centre at Louisiana University in the US and published in the Journal of the American Medical Association, eating about 25% fewer calories for six months has a positive bearing on better health and longer life. The findings of the study -- called the Comprehensive Assessment of the Long- Term Effects of Reducing Intake of Energy (CALERIE) -- suggest that all subjects included in the study who dieted or increased their exercise lost body weight but those who reduced their calorie intake registered lower fasting insulin levels and lower body temperature. They also had less oxidation damage to their DNA, which is a marker of ageing at the biochemical and cellular level. Low-calorie diets have been found to drive the body to replace and repair damaged cells. The effects of reduced calorie intake on health and longevity were first observed in laboratory rodents in the 1930s when it was found that rodents fed on a severely reduced diet outlived their well-fed peers. These effects were later observed in other organisms such as yeast, flies, worms and dogs. More than a decade ago, John Holloszy, professor of medicine at Washington University in St Louis, Missouri, had demonstrated that a strict calorie- reduced diet in mice and rats increased their longevity by about 30%. Similar results have been obtained in the study of rhesus monkeys. Recently, Professor Stephen Spindler and his collaborators at the University of California have discovered that reducing calorie intake even later in life results in substantial health and longevity benefits. Fat reserves in the body release fatty acids into the bloodstream, which promotes insulin resistance and an increase in insulin levels. Excess glucose in the bloodstream damages blood vessels and nerves and has an adverse effect on the whole system. The accumulation of fat undermines insulin sensitivity and glucose tolerance in the body, which may result in Type-2 diabetes and a host of other diseases, including high blood pressure and elevated triglycerides. One of the most effective ways of fighting insulin resistance is calorie reduction, which can be achieved through fasting. Some studies show that fasting is efficacious in alleviating the symptoms of schizophrenia. Though there has been substantial economic growth worldwide in the past two decades, more than a third of the world's population still lives in poverty. Some 1.1 billion people around the world live on less than the internationally-accepted poverty line of $1.25 a day. Up to 2 billion people around the world are affected by food insecurity. Global aid agencies and NGOs reckon that despite substantial reduction in poverty during the past two decades, nearly a billion people around the world will be still living in poverty in 2015. Poverty, chronic malnutrition, hunger and disease continue to take a heavy toll of children's lives in large parts of Africa and Asia. More than 3.1 million children in Africa and Asia die from hunger, starvation and disease. It is not that there is not enough food in the world for the global population. According to an estimate by the Food and Agricultural Organization (FAO), world agriculture produces 17 per cent more calories than it did 30 years ago, despite a 70 per cent population increase during this period. This is enough to provide everyone in the world with sufficient calories. It is ironic that while one-fifth of humanity is dying for food, the world's affluent nations have no qualms about wasting enormous amounts of food. A study carried out at the University of Arizona in Tuscan in 2004 had revealed that almost half of the food in the US goes to waste. According to a government study carried out in 2008, Americans waste an astounding amount of food, an estimated 27 per cent of the food available for consumption. A couple of years ago the Guardian newspaper in the UK had carried out a survey, which revealed that Britons waste more food than people in any other country-throwing away as much as 40 per cent (6.7 million tonnes) of all the food they produce and buy. If people in the industrialized nations knew what it means to experience hunger over several days or months-which they obviously don't-or if they had spared a moment to reflect on the plight of millions of poor and hungry people around the world, they would not indulge in such a staggering and criminal waste of food. Fasting for 12-14 hours each day over a month -- without taking even a drop of water --makes one realise what it means to experience persistent hunger and to empathize with millions of hapless people around the world who are condemned to lead a life of misery and destitution. 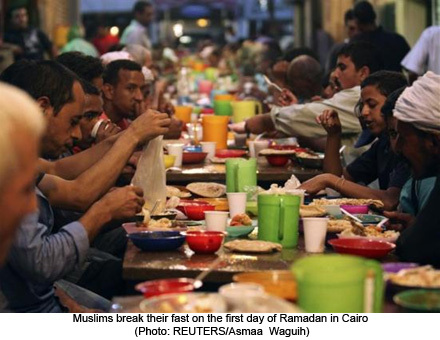 Fasting deepens and humanizes our sensibilities and makes us more compassionate towards our less fortunate brethren. In the Islamic tradition, fasting is prescribed as a means of physical cleansing and healing as well as moral and spiritual purification. The process of oxidation, which results from unhealthy dietary habits and lifestyle and causes cell and tissue damage, can be used as an analogy in respect of the human self. The oxidation of the self-like the rusting of metal-takes place when vicious qualities and traits (such as pride, selfishness, greed, deceit, hypocrisy, excessive self-gratification) begin to dominate one's consciousness and behaviour. In order to clean up this existential mess one needs to take recourse to methods of moral and psychological detoxification: self-introspection, repentance, penitence, prayers, meditation, fasting. Fasting has multi-layered effects because its therapeutic benefits encompass the body, the self and the soul. Supererogatory prayers (Tarawih) are an important feature of the holy month of Ramadan. These prayers are suffused with spiritual, moral and social blessings and benefits. Since these prayers are required to be performed in a congregation in the mosque or prayer hall, they reinforce social and inter-personal interaction and deepen the sentiments of equality and brotherhood, sharing and social cohesion. According to Islamic belief, the disbursement of zakat-tax in the month of Ramadan carries multiple, greater rewards and blessings. One of the objectives of this belief is that the poor and disadvantaged sections of society get some extra money to meet their expenses during the holy month and for the Id festival. 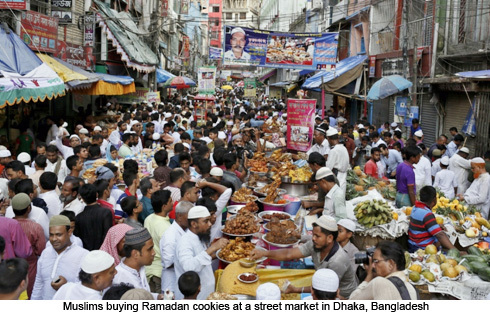 Across the Muslim world, the holy month of Ramadan is marked by a pervasive atmosphere of celebration and festivity. 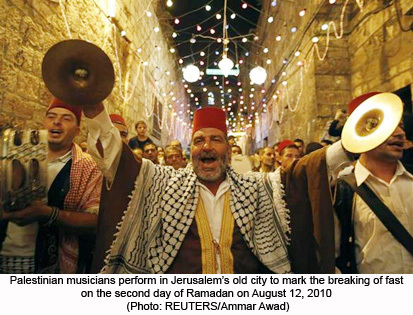 This atmosphere, which prevails at home, in the mosque, in the neighbourhood and on the streets, mitigates the physical strain of fasting and intensifies communitarian solidarity. In the Muslim world, it is common to see makeshift tables laid out on the streets, filled with dates, fruits and locally-made cookies, just before sunset. This marks a collective breaking of the fast, to which everybody, rich and poor, educated and illiterate, is invited, and which presents a vivid glimpse of egalitarianism, brotherhood and the culture of sharing that are a prominent feature of the Islamic tradition. 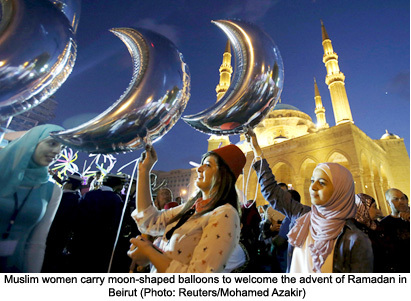 Non-Muslims are greatly fascinated by this public gesture of sharing and conviviality.